by Dave from The Longest Way Home ~ September 15th, 2015. Published in: Travel blog » Nepal. 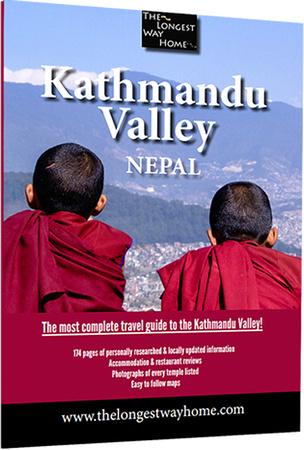 25% off Kathmandu Valley Guidebook! While some hoteliers will make you believe “September”, as in September 1st, is the start to the peak season in Nepal, it’s really September 15th. The reason for this is simple – sometimes the monsoon season hangs on a few weeks. This year the monsoon season has ended early. So the rains have eased and the bright blue Nepalese sky is starting to shine through. This is the start of perfect weather for trekking, jungle adventures, white water rafting and heritage visiting. From now until December is the best time to visit Nepal! With the year that Nepal has had I’m here now to support Nepal and to help you learn and experience the best Nepal has to offer. To celebrate the start of peak season in Nepal I’m offering a 25% discount on all my top Guidebooks to Nepal! There are no coupons to worry about as I’ve already reduced the price. The sale ends September 21st, so don’t delay! How is Nepal right now? I’m here live on the ground and I can tell you that Nepal is just fine to visit! If you’ve never been to Nepal before, there’s little evidence of earthquake devastation here unless you go looking for it. If you have been to Nepal before then you will notice damage. Particularly in Kathmandu Durbar Square. Patan Durbar Square last week!” width=”500″ height=”333″ /> Patan Durbar Square last week! Are there parts of Nepal to avoid? Langtang and Manaslu trekking routes are not ready for trekkers yet. But Everest Base Camp and all of the Annapurna treks are. See my list of treks in Nepal for an uptodate list. The far south west Terai region (which is not a tourist) should be avoided. Of all the heritage sites Kathmandu Durbar Square is not in good shape. You can still visit, but the earthquake damage and lack of reconstruction is very evident (I’ve met with the heritage department about this and will have a follow up in the coming weeks). However, Bhaktapur (which I’ve always prefered) is in very good condition as is Patan and Kirtipur. Bhaktapur is the new king of heritage in Nepal – it’s being maintained and looked after a lot better than the capital. Stay a few nights in Bhaktapur and it’s like living in another ancient world – just amazing. Patan is the crown prince of heritage in Nepal – even with two destroyed temples Patan Durbar Square is in pristine condition. Asides from that the great north and south parts of Patan offer up temples few people get to see. All listed as part of my walking tours in the Kathmandu Valley Guidebook. Everest Base Camp is open to trekkers right now! Pokhara was not effected by the earthquake. The start of the Annapurna trailheads the resort town is filled with activities to do from boating, hiking, rafting, paragliding, micro-flights, massages and spas. Chitwan National Park is another area not effected and offers up jungle treks, elephant washing, tiger spotting, raftign and more. Lumbini is still the place to visit for all tourists wanting to visit the birthplace of The Buddha. I won’t hold back on any punches here. Since returning to Nepal I’ve been very disappointed in the lack of “official” rebuilding of heritage sites. However, I have seen a new hope. Private heritage rebuilding is taking place. 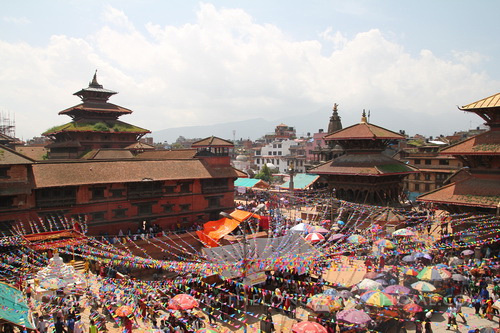 Organisations like the KVPT have already started work on 4 restoration projects including Mul Chowk in Patan. By visiting Nepal yourself, independently, you are directly supporting Nepal, the people and places of Nepal that need it most. That guesthouse you stay at? Your nightly fee is helping them directly. That lunch you are in Bhaktapur, it’s helping to keep the restaurant open. This is the reality of visiting Nepal. You will be directly helping the people and places in this great country. Why are my guidebooks to Nepal are better than the rest? If you’ve already bought a BIG brand name guidebook then no problem. Just try downloading one of my smaller guidebooks from only $0.99 and you’ll see the difference! My guidebooks offer you a real life look at the sites you will be visiting. Example: look at that BIG brand guidebook you have in your hand. Turn to Kathmandu Durbar Square and look at the map. Nice. But take a second look. Do the descriptions really tell you what you are looking at? All those small black lines and dots? Now swing over to my guidebook to Kathmandu city. There’s no need to endlessly swipe to find Kathmandu Durbar Square just use your finger to click on the menu and you’ll be taken to that spot in the book – easy. Look at the nice big map of Kathmandu Durbar square with actual photographs showing you what and where each temple is! Nice eh? It gets better. Simply click a temple on the map and you’ll be taken to a larger photo and description! Great! Want to go back to the map to get your bearings? No problem, just click the map icon! It’s that easy. No more getting lost or twisting that guidebook map around. I’ve built all my guidebooks to help you are a visitor to Nepal to get the most from your trip and to cut down on time wasting and to directly show you what you are looking for. Want more? No problem. I’ve personally visited all the hotels and restaurants listed in these books. From budget places to high end with no one knowing who I am other than just another guest. Add in history chapters, transportation and so much more you won’t be disappointed! 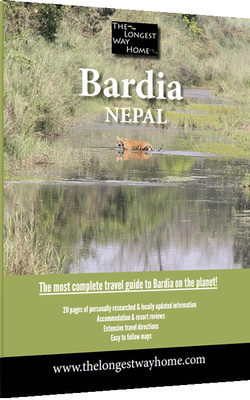 These independant guidebooks to Nepal will show you Nepal like it really is. Try one, I promise you will see the difference right away. If you are just visiting the Kathmandu Valley – I recommend my guidebook to The Kathmandu Valley which has 25% off right now! 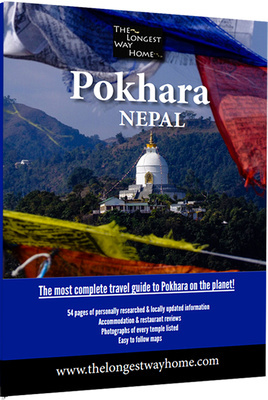 If you are visiting Pokhara for adventure and relaxation I recommend my guidebook to Pokhara which has 25% off right now! If you are only visiting Kathmandu city then I recommend my guidebook to Kathmandu city which also has 25% off now! Meanwhile for jungle adventures get my Chitwan guidebook – only $0.99! Finally, to get these offers take a look around all my guidebooks to Nepal as some are only $0.99! All guidebooks can be viewed on iPhones, iPads, Android devices, laptops, PC’s and print!